In 1943, Usibelli Coal Mine Inc. was founded by Emil Usibelli in order to provide coal to the precursor of Fort Wainwright. 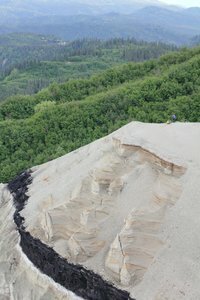 The mines that Usibelli operates take advantage of abundant subbituminous coal near the surface in the Healy area, including some seams over 40' thick. Over the years the family-owned Usibelli has expanded its operations and currently employs about 120 people and produced around 1.6 million tons of coal in 2013. All of the mining operations at Usibelli are strip mining operations, in which vegetation, soil and rock ("overburden") are removed and then the coal is mined in open pits. The removal of overburden is accomplished with the help of a giant electric dragline nicknamed "Ace-in-the-Hole" which moves up to 7 million cubic yards of overburden per year. Since 1971 Usibelli has been the only company actively mining coal in Alaska. They currently operate in the Nenana Coal Field, south of Fairbanks, and hold active permits for four sites in this area; Poker Flats (no longer mined and largely reclaimed), Gold Run Pass (idle, and under partial reclamation), Two Bull Ridge (active), and Rosalie Mine (inactive). In addition, Usibelli holds leases and permits for two additional mines. One is only a few miles north of their existing operations, and would extract coal from the region near the old Jumbo Dome mine. Usibelli is currently building an access road to this site and has received permits to begin mining there. The other is at Wishbone Hill, located 40 miles NE of Anchorage, which would be the first Usibelli mine outside the Nenana Coal Field. Exploration of the deposit and a feasibility study are currently underway at Wishbone Hill. On a map of Alaska, my eyes are drawn to the glaciers and fjords, coastlines, and dramatic topography. The only thing that stood out about Usibelli was the coal mines. Coal mines? Of the coal currently produced by Usibelli in 2011, about half was exported via a coal dock in Seward to South Korea, Japan, and Chile, while the remainder was consumed within Alaska. However, by 2015, exports only made up a small percentage of the total coal mined, due to decreased demand and falling prices. In total, coal provides energy for less than 10% of the electricity used in Alaska (compared to 50% for the United States as a whole in 2011). Over half of the Usibelli coal burned in Alaska is used by the military. Usibelli coal is used in the Fairbanks area by Fort Wainwright, Eielson Air Force Base, Clear Air Force Station, Aurora Energy LLC (0wned by Usibelli), University of Fairbanks (UAF), and a Golden Valley Electric Association (GVEA) "mine mouth" plant in Healy. Lastly, a small percentage of the coal is destined for retail use within Alaska through the Northland Fuels and Energy company. Usibelli was the coal supplier and a financial partner in the defunct Healy "Clean Coal" Plant (HCCP). Usibelli has also been involved with the proposed Emma Creek Power Plant project which would be located near the Jumbo Dome mine as well as a nearby proposal for a coal-to-liquids plant. Machinery pulls coal out of Two Bull Ridge coal mine. In February 2012, Usibelle received permits to expand their operations at Jumbo Dome for up to three million tons per year. However, coal exports by Usibelli also dropped from 1.3 million tons in 2011 to 877,000 tons in 2012 and then fell to only 150,000 tons by 2015.